In its first-ever partnership with a nonprofit organization, Snapchat is releasing a series of new filters to mark World AIDS Day in collaboration with (RED) and The Bill and Melinda Gates Foundation. 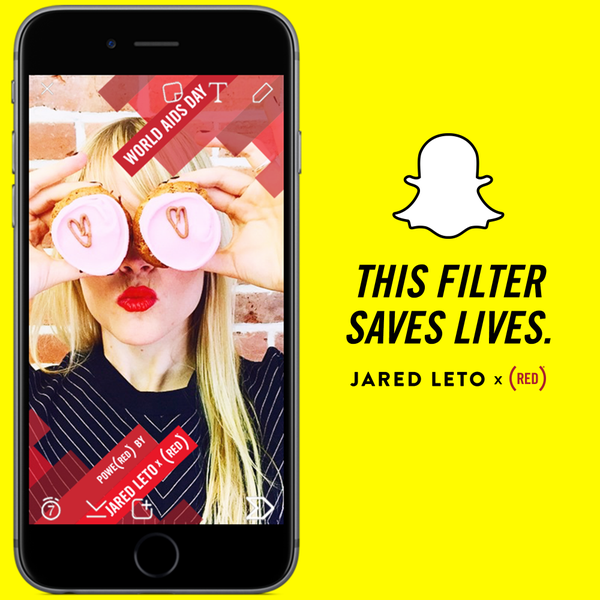 The new filters are each named after a celebrity, including Jared Leto, DJ Tiesto, and Jimmy Kimmel, and are only available for 24 hours. Each time the filters are used, The Gates Foundation will donate $3 to the (RED) organization — up to $3 million — reports Fortune. (RED) is part of the ONE Campaign, an organization dedicated to eliminating new HIV infections. According to (RED), the $3 raised as part of the Snapchat partnership can provide 10 days of life-saving HIV/AIDS medicine in sub-Saharan Africa. The latter is the most infected region in the world, where it is estimated that over 25 million people live with HIV/AIDS, according to the World Health Organization. As mentioned, this is Snapchat’s first collaboration with a nonprofit. In the past it has created sponsored filters for companies such as McDonald’s and sponsored lenses for The Peanuts Movie. (RED) has consistently partnered with brands and social media platforms. As part of World AIDS Day, (RED) is also joining forces with Uber and Coca-Cola. In the past, the organization collaborated with Twitter, Foursquare, and the Twitter-owned video service, Vine. World AIDS Day is an annual event declared by the United Nations, taking place around the globe. On the eve of this year’s event, the Empire State Building was illuminated in red. Elsewhere, marches were held in Thailand and India, and 10,000 candles were lit in Amsterdam’s Arena to commemorate this past year’s AIDS victims.